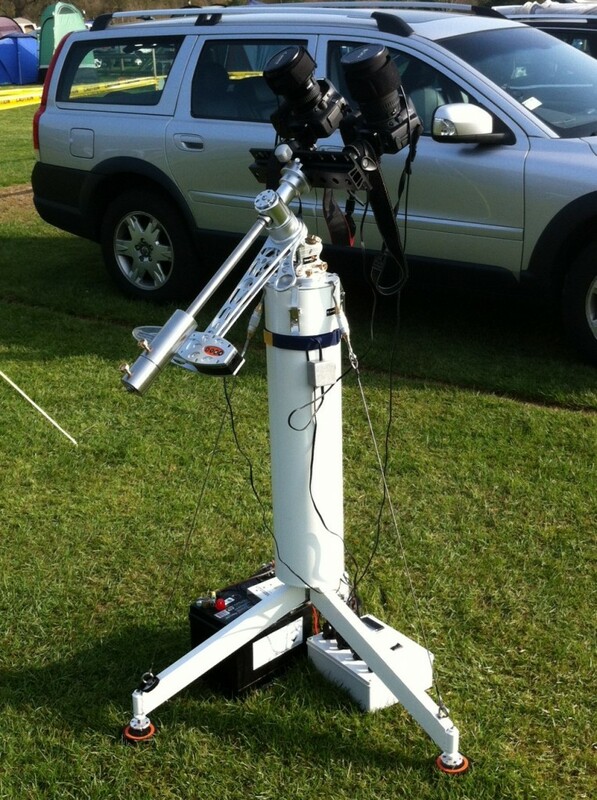 The range of equipment available to the amateur astronomer today is just totally bewildering at times. 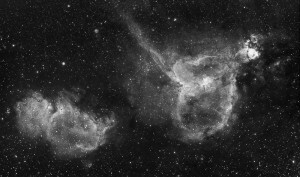 Please click on the links above here to have a look at what my current setup is for both visual astronomy and astro-imaging. I guess the recent changes to my telescope “arsenal” have come about following the purchase of my full frame SX-VR H36 camera, and trying to match the optics and accessories to maximise the quality of the images the camera produces. For several years I have been trying to find a Pentax 75 refractor, when one came up a couple of years ago, I had to have it. The Pentax 75 was the perfect widefield companion for the SX-H36, with a full frame illuminating (designed to illuminate large format Pentax film cameras) “flat field” pretty much straight out of the box. This combination gives a staggering 4ox3o frame. Another excellent source of advice on equipment, its uses and its limitations, is on the pages of Stargazers Lounge, the online astronomy forum. The Equipment Discussion boards are invaluable sources of information and help to the beginner and experienced astronomer alike. 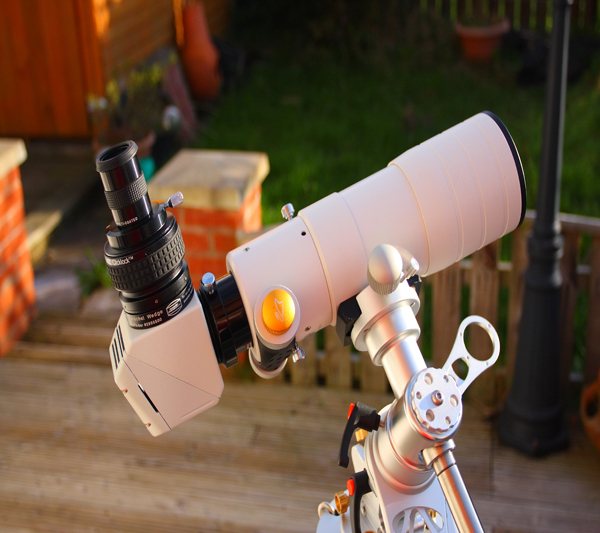 Lastly, and by no means least, there’s Steve, James and Martin at First Light Optics who will give an unbiassed opinion on a wide range of astronomy and optical equipment. I’m constantly adding Equipment information to the site as I go along. This section should also cover, in the near future, telescopes, mounts, filters, software, accessories and the observatory. Just click on any of the equipment below to see more detail from the accordion. This Calcium-K module transforms a normal astronomical refractor telescope into a Ca-K solar telescope. The Ca-K module is slotted into the 2″ focuser of the telescope, and you are ready for solar observing in the light of the Calcium-K wavelength. Internal narrowband filters allow for a <2.4 Angstrom bandwidth. 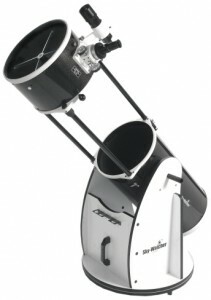 For refractor telescopes up to 100mm aperture and up to 1080mm focal length. For imaging it will be better to use a bigger Ca-K module. The Ca-K module is in a 90° star diagonal, for 2″ focuser on the telescope side, and with T2 thread and 1.25″ eyepiece connection on the eyepiece side. All needed filter parts are integrated inside the compact module. There are no additional filters needed. The Ca-K wavelength is at the edge of the visible light spectrum for human eyes, so for many people visual observing is difficult. However, all details could be captured photographically. Therefore the Ca-K Module is optimized primarily for imaging. 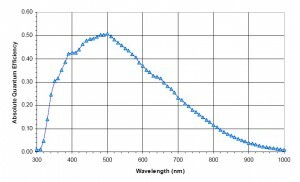 The Baader Solar Continuum Filter is a true narrowband filter featuring a 10nm half-bandwidth (HBW) at the passband of 540nm. Most achromatic doublet objectives used in astronomy are not corrected equally across the visual spectrum, this filter isolates the spectral range where most achromatic lenses are well corrected, this yields the best contrast and sharpness for economy refractors. Solar granulation is most contrasty at the 540nm spectral range. The Baader Cool Cermaic (Safety) Herschel Solar Prism is for white light observation of the sun. According to various pieces of literature, these are reputed to give unparalleled views of the white light disc of the sun, a view which I can confirm when comparing with views through the well respected Baader solar film. The instrument itself comes very well packaged in its own dedicated aluminium storage case. I bought the visual version of the instrument, this comes with a pre-mounted 1:1000 (OD 3.0) neutral density filter and a Baader solar continuum filter. The ceramic window essentially forms a safe solar finder screen, and, as can be seen in the photo above, it comes with a 2″ Baader clicklock eyepiece clamp. Light entering the unit enters and passes through the body of the prism body. On reaching the inclined back surface of the prism (@45 degrees), 4.6% of the light is internally reflected upwards towards the eyepiece holder. The use of the 3.0 density filter further reduces the intensity of this light down to suitable levels for visual use. The remainder of the light exiting the prism (95.4%) is passed into a heat cage which is sealed with a heat-absorbing ceramic cage, the back plate of which acts as the finder screen. I have only tested this out for about 90 minutes, but there was no discernible temperature rise of the body of the prism. The only drawback I have found so far with this unit “out of the box” is that it failed to reach focus with a digital SLR attached (lack of in-focus), though this was remedied within a couple of days with the purchase of a Baader #27 2″ to t ring which replaces the clicklock and gives an extra 3cm or so of in-focus. 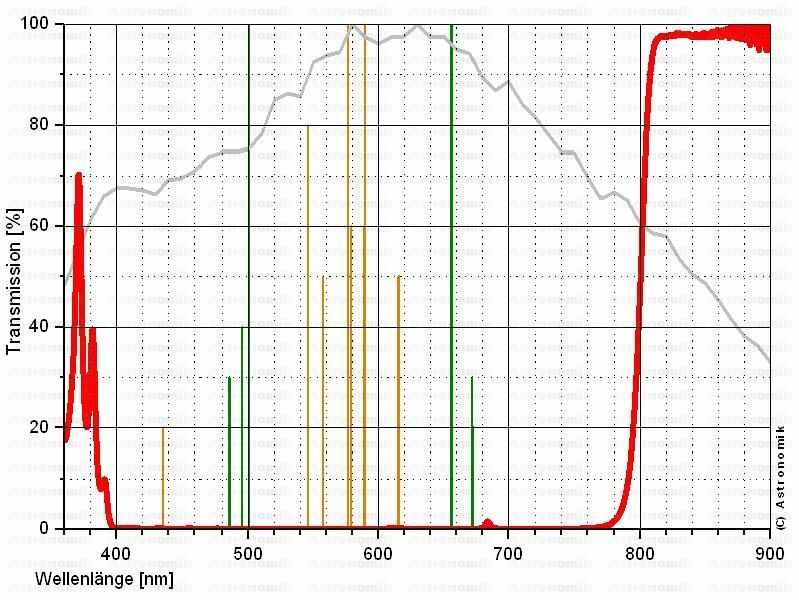 The red line shows the transmission profile of the filter, which shows an 97% transmission of wavelengths above 807nm. The grey line shows a typical CCD response curve. 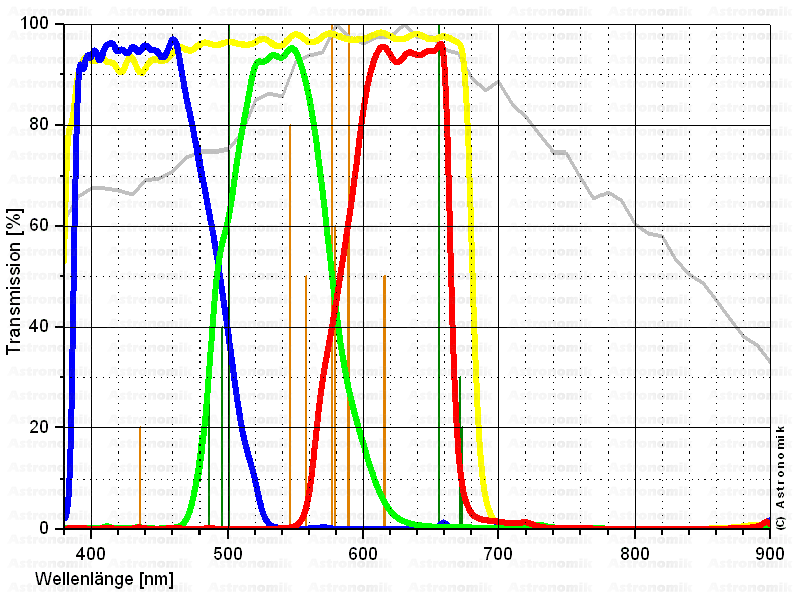 Other vertical lines show important astronomical wavelengths such as OIII and Ha (green), and some of the unwanted wavelengths such as Na and Hg vapour lamps. The 807nm version of the Planet IR Pro filter is only suitable for telescopes greater than 10″ aperture. For smaller scopes, Astronomik recommend the 742 filter. 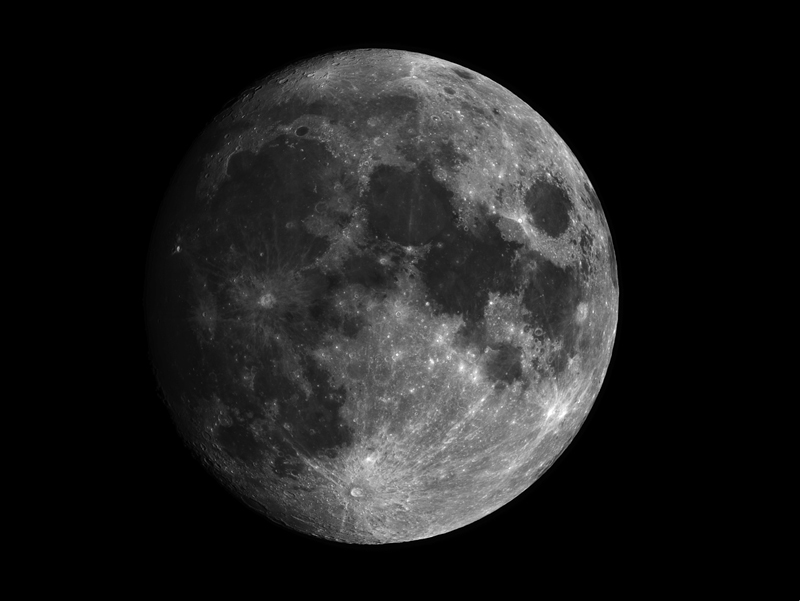 The filter works extremely well on brightly illuminated objects such as the moon or Jupiter, but, in use, exposure time is significantly altered. 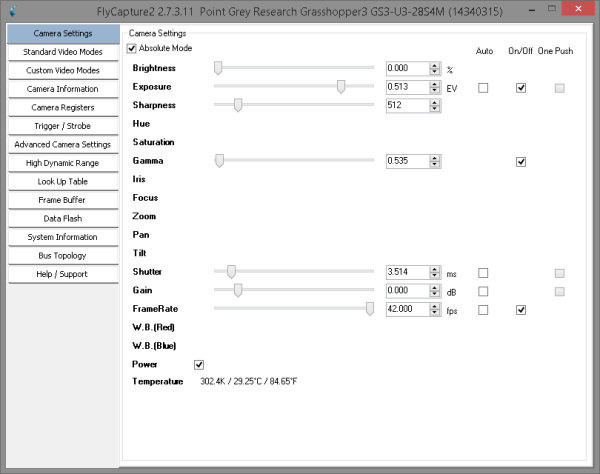 When using this filter with a mono CCD, there is a noticeable improvement in the resultant signal to noise ratio achieved when compared to using no filter. For narrowband imaging I have been using the Baader series of filters. I have a set of four NB filters covering the emission lines of Ha, O[III], Hb and S[II], giving very narrow bandwidths of 7nm, 8.5nm, 8.5nm and 8nm respectively. 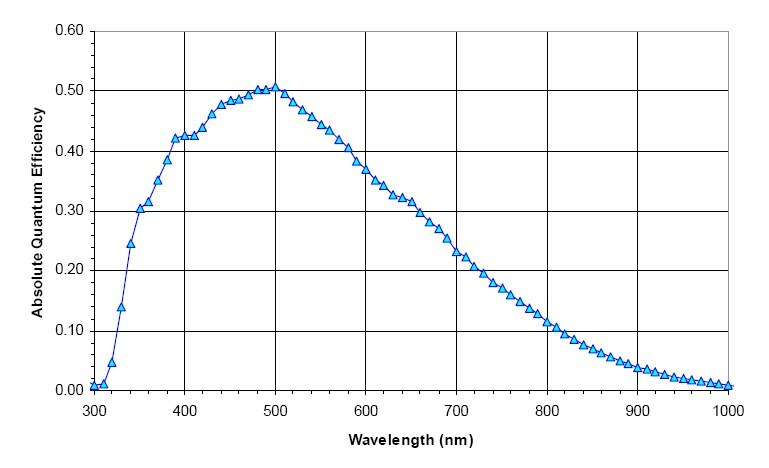 The Baader filters have very high transmission rates while completely rejecting light pollution as well as the important blocking of longer wavelengths. I am yet to see any problems with reflections with the Baader filters. H-alpha (Hα) is a specific red visible spectral line created by hydrogen with a wavelength of 656.28 nm, which occurs when a hydrogen electron falls from its third to second lowest energy level. Much of the nebulosity seen within our own galaxy is created by hydrogen clouds which, when energised by an external source such as a nearby star, emit light at this wavelength. The 7nm is a good compromise between a narrow bandwidth and retaining around 90% transmission rates. 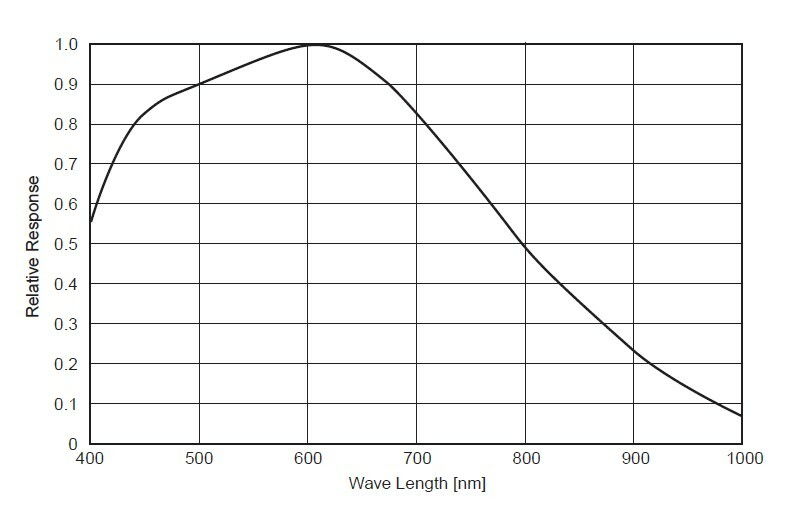 A typical transmission curve for a 7nm Baader Ha filter is shown below. O[III], also known as doubly ionized oxygen, is a forbidden line of the ion O2+. It is significant in that it emits light in the green part of the spectrum primarily at the wavelength 500.7 nanometres (nm) and secondarily at 495.9 nm. Concentrated levels of [O III] are found in diffuse and planetary nebulae. making O[III] filters in both imaging and observing these objects, visually causing them to appear at higher contrast against the filtered and consequently blacker background of space (and possibly light polluted terrestrial atmosphere) where the frequencies of [O III] are much less pronounced. A typicall transmission curve for an O[III] filter is shown below. As part of the same Balmer series as the hydrogen alpha emission, the hydrogen beta represents an emmission with much higher energy, and represents an electron in the hydrogen atom falling from its fourth level back to the second level which results in a more energetic photon emission at 486.1nm (cyan colouration). A typical transmission curve for Hb is shown below. Finally there is the S[II] filter which centres around the emission from Sulphur atoms. Sulphur emission areas are often associated with wavefronts in emission nebula such as the outer areas of the IC1396 nebula, and the cygnus wall part of NGC7000. 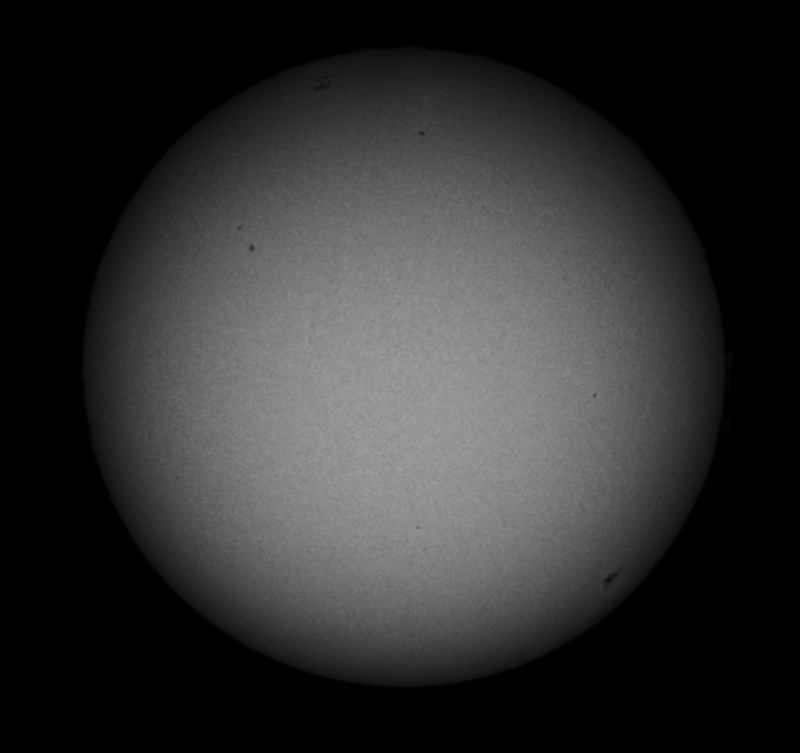 Compared with the other narroband filters mentioned here, the S[II] filter needs longer exposures to be useful. The popularity of this filter has increased recently as it is used as part of the “Hubble Palette” which maps S[II] to red, Ha to Green and O[III] to blue. A typical emission curve for an S[II] filter is shown below. I use a set of 2″ Astronomik (type 2c) colour filters consisting of Luminance, red, green and blue filters. These have been optimised for CCD imaging and are parfocal with not only each other, but also with the Astronomik IR Block and IR Pro 807 filters which I use for planetary imaging. 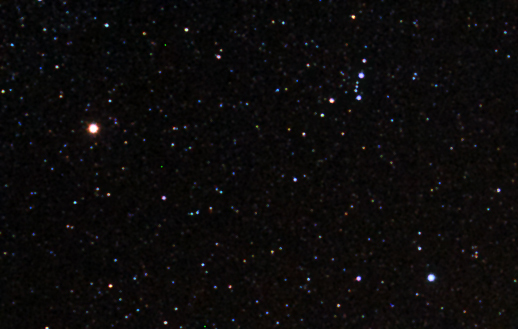 As you can imagine, this speeds up the whole imaging process somewhat, especilly on fast moving subjects such as Jupiter. The filters show excellent cleaning characteristics and are diffraction limited. A typical set of transmission curves for these filters (as supplied by Astronomik) are shown below. The grey line on the trace above shows the transmission response of a typical CCD detector as used in astronomical cameras. As you can see from the traces for L,R,G and B, these filters exhibit inbuilt UV and IR block characteristics. Point Grey GS3-U3-28S4M-C camera. Weighing in at only 90g, this camera packs a lot of punch for its weight. Using the Sony ICX687 progressive scan CCD at 1928 x 1448 the unit has 3.69 micron sized pixels. 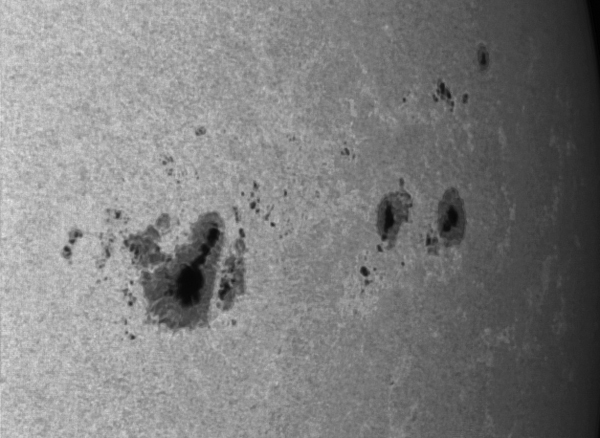 I chose this camera to be a match for my Lunt LS60THa solar scope (fl – 500mm), where the combination gives a full Ha solar disc for imaging. The camera utilises USB3 for fast download speeds – the camera can operate at 2.8 Megapixels at up to 26 frames per second. The camera has an excellent quantum efficiency of 71% at 525nm. 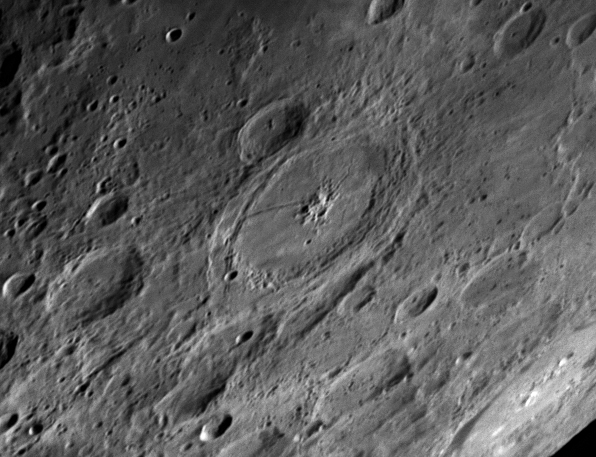 This test image of the moon was taken through a Pentax 75 at 500ml focal length. 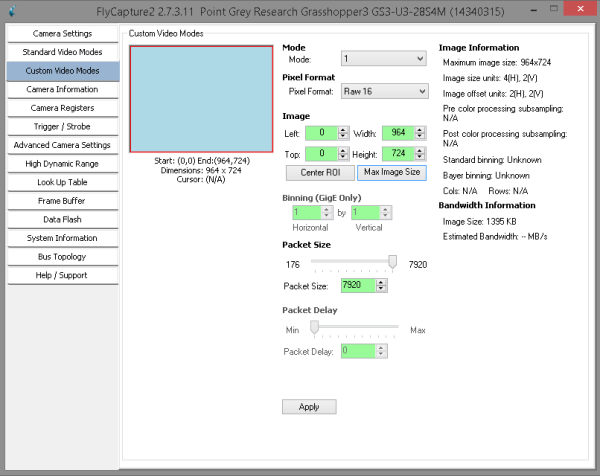 The camera performs very well, and although the Point Grey control software is not very intuitive, it does the job and produces images suitable for stacking. 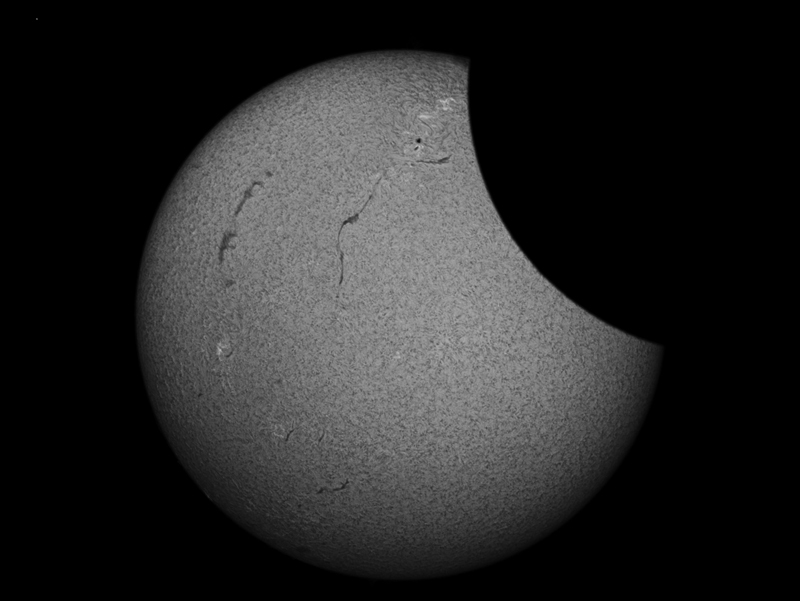 The second image below shows a solar image taken during the recent solar eclipse. This filter wheel is very reliable, and usually quick in operation. 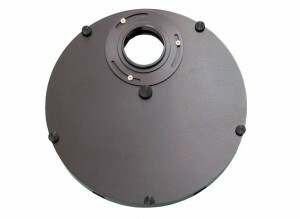 The SX wheel is very light and slim, with an easy change system of thumbscrews to swap filter disks without tools. Although I use this with only two cameras (T thread and 72mm thread) a wide variety of threaded adaptors are available. The adaptors can be swapped relatively quickly by using a small screwdriver to release three stainless screws and lifting off the adaptor flange. Each flange can be rotated to any angle before locking down, so that you can orient the wheel and camera into the optimum position. 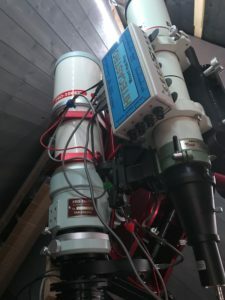 I use this system with the active optics unit so need to install the SX slimline off axis guider (together with a lodestar guider, this combination can be seen below). For more information on this equipment, take a look at the SX manual which can be downloaded from their website or from below. Short optical length – 70mm with OAG, 38mm without. I use the SXV-AOLF with the supplied off-axis guider assembly with a Lodestar to view the edge of the telescope field via the 10mm square prism. Unlike cameras with an integrated guider chip, the OAG puts the guide camera ahead of any filters that the user fits into the camera ring recess and so its sensitivity is always at maximum. The guide camera mounting is designed to be parfocal with an SX camera when used in this combination – fine focus adjustment is provided by moving the threaded guider mount along the prism tube. If you do not need the OAG barrel (e.g. when using a camera with a built-in OAG or guide chip), you can fit the 72mm or T adaptor directly onto the rear of the AO assembly. I also use the SXV-AOLF with the ‘Ultraslim’ OAG and filter wheel assembly, though it did take a little while to sort out the adapter rings for the 72mm threads used on the SX-VR H36. Monochrome USB 2.0 Astronomy Camera with 60 fps for Astrophotography – without IR cut filter. 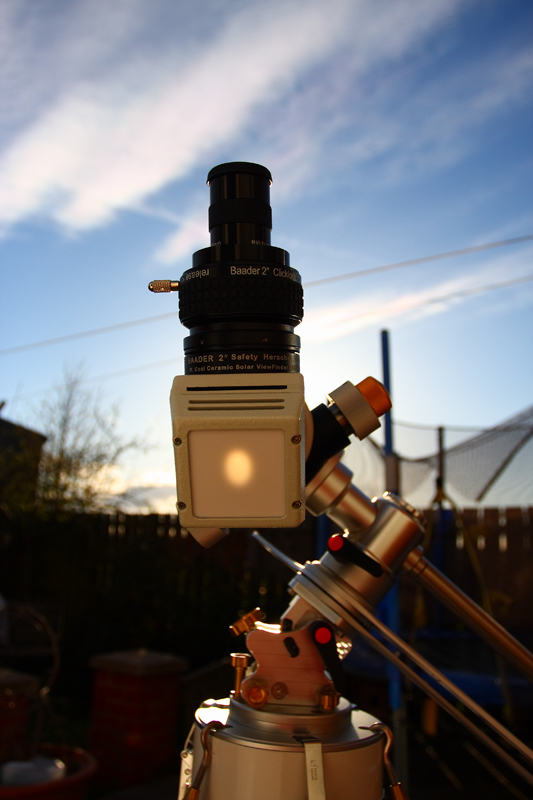 With 60 fps, the monochrome astronomy camera DMK 21AU04.AS is the fastest within its category. It is ideally suited to black and white astrophotography, in which very fast image sequences are captured. Using the shipped software – IC Capture.AS – you can capture lossless and uncompressed images sequences as AVI files. 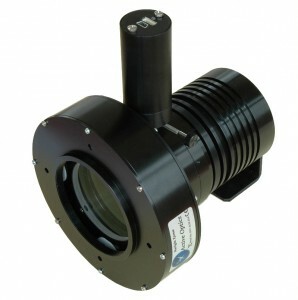 The astro CCD camera DMK 21AU04.AS uses the monochrome progressive scan CCD ICX098BL from Sony®. With its 1/4″ format, the CCD produces a resolution of 640 x 480 pixels. 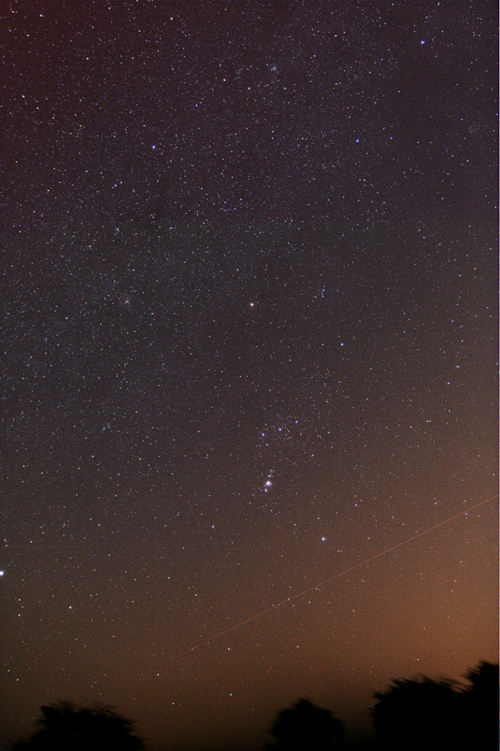 Even at long exposure times, its noise is minimal. 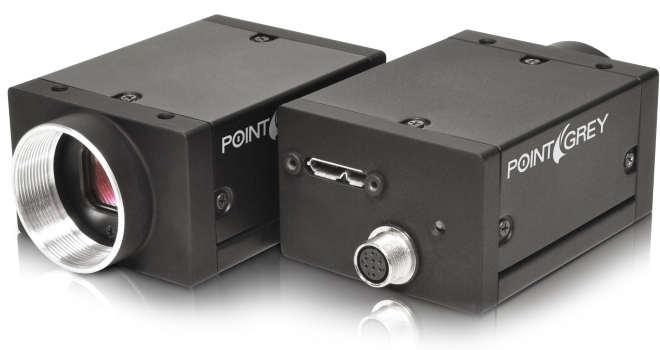 Thanks to its unsurpassed quality, the ICX098BL is often used in industrial image processing applications. 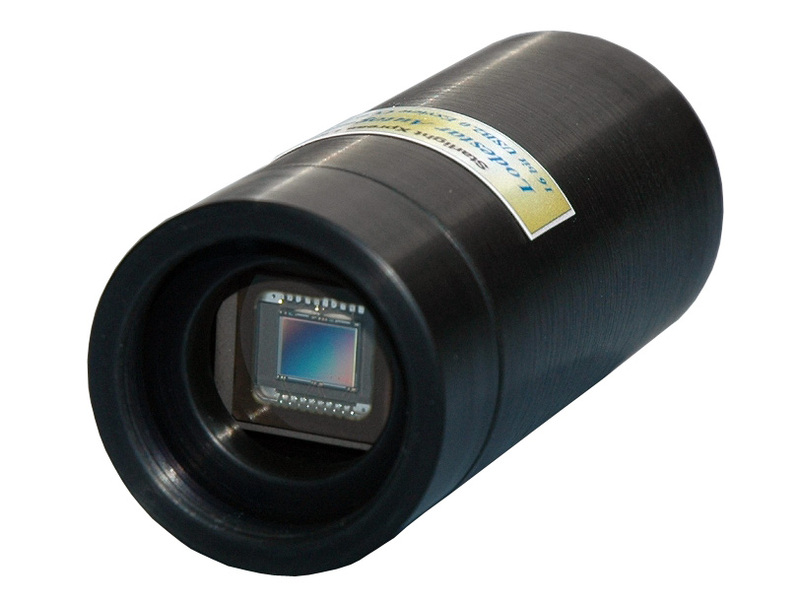 The CCD camera DMK 21AU04.AS does not use compression, nor does it have an IR cut filter, a color filter or an electronic filter. Thus, the camera produces very true-to-life captures of the night sky. Images above show some of the capability of the camera. The Starlight Xpress Lodestar is a very sensitive USB2.0 guide camera supplied in a miniature package. The image is achieved through sn Exview CCD with 752 x 580 pixels, USB powered, Opto-Isolated control outputs. 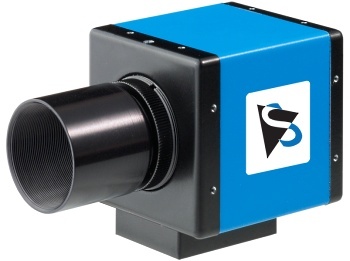 The SXVR- H36 camera is the largest in the SX line of Kodak CCD based imagers. To reduce the negative effects of the greater Kodak dark signal, Starlight Xpress have used a two stage Peltier cooler for an extra 10 degree reduction in the CCD temperature, and a new high-speed USB2 interface circuit to greatly reduces the download time to just a few seconds. The fast download minimises the visibility of bias frame artefacts, such as hot columns and the top to bottom gradient that is commonly seen on such chips. The camera has a lowered HII sensitivity when compared with my previous Sony 285 equipped ccd, but still outperforms my expectations when handling HII (see Heart & Soul image and spectral response & QE curve below). The latest upgrades of Maxim DL and a firmware upgrade on the camera (thanks Terry) allowing the close control of temperature during exposure. I got my roll-off-roof observatory in the spring of 2009. Although it is much easier with a permanent setup, due to various other committment, I still haven’t fully utilised the observatory yet, but here’s hoping to Autumn/Winter 2010/2011. 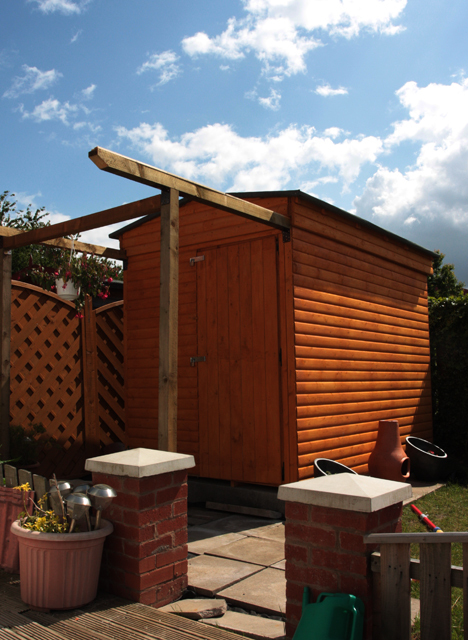 A local shed manufacturer built the base to my specifications, I built the rolling roof assembly using matched materials. Internally, the telescope area is 6′ x 6′ with a small separate “computer” area for image acquisition and telescope control. The telescope area is more than adequate for the widefield imaging rig, but does get a little snug with the 12″ LX200R fitted. The latest purchase to enable some travel astrophotography, an Astrotrac Travel System. 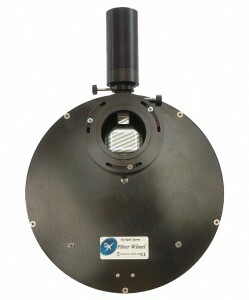 AstroTrac TT320X-AG; ultra precise and compact equatorial tracking mount. 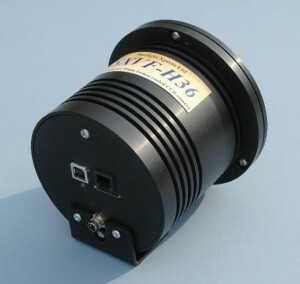 TH3010 Head; makes it easy to mount telescopes to the TT320X-AG. TW3100 Wedge; high strength compact equatorial wedges. TP3065 Pier; ideal platform for the AstroTrac tracking mount and wedge. The system is shown above with a dual mount bar with two DSLR’s, the whole system (including dew heaters) is run from a 75Ah leisure battery including 12v supplies for cameras. The system requires no computer control as each DSLR is controlled by its own intervalometer. The modified Petzval design of the FSQ-106ED, with field-flattener integrated into the tube, makes it possible to cover all the photographic formats from 35mm SLR/DSLR to 6×7 cameras! 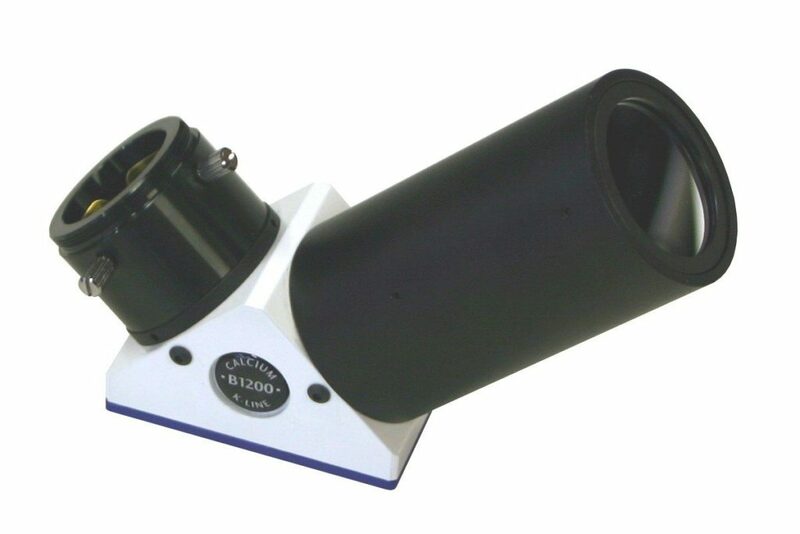 No other 4″ refractor offers the same 88mm diameter imaging circle (field of 9,5°). Can be used with large sensors without risk of vignetting or loss of definition in edge of field. The objective is entirely collimateable so mechanical and thermal stresses can be adjusted out, should it ever be necessary (we advise the telescope be returned to Takahashi for collimation). This latest model FSQ106-EDX IV is fitted with a newly designed heavy-duty 4″ rotatable focuser with an integrated camera angle adjuster. It will lift up to 11 lbs, and hold it there without slipping! It also includes a micro-edge fine focuser for precise focus adjustments. Combine that with a 2″ or 1.25″ eyepiece adapter and you’ll be prepared to tackle any operation. Takahashi manufacture their own focuser and aluminum castings and adjust them individually for consistent, high quality. The EDX IV features 178mm of back focus to enable easier assimilation of accessories such as filter wheels and off axis guiders. Thanks for taking a look at urban-astronomy.com. Feel free to contact me using the contact page, and stay updated by subscribing to the RSS feed.